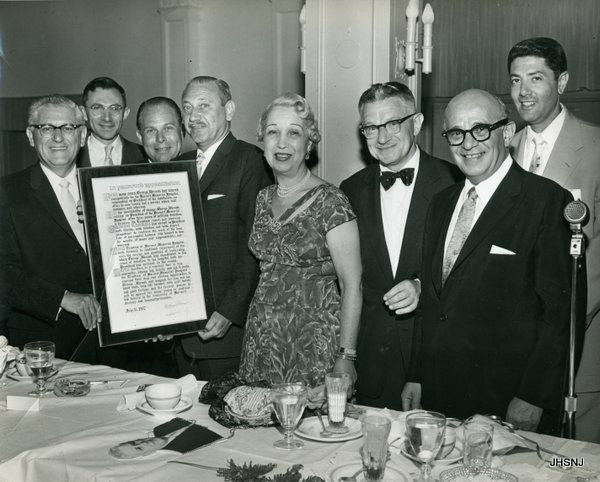 The 1957 Barnert Hospital testimonial to George Abrash on July 11, 1957…l-r: George Abrash, Dr. Chung(sp? ), Ralph Gitkin, Archie Marcus, Anne Abrash, Dr.Sandor Levenson, Nathan Kluger and Harvey Schoenfeld. 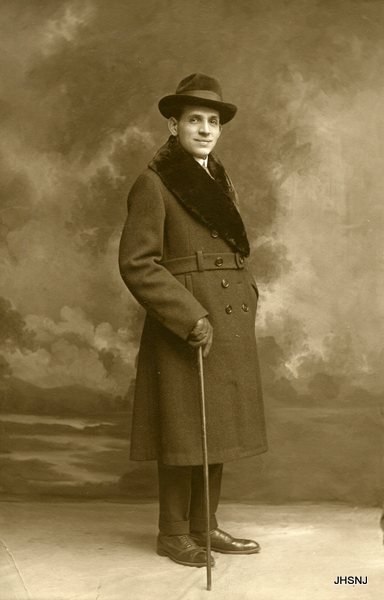 Paterson Dapper Dan…who is this mystery man? What is this dandy up to…? 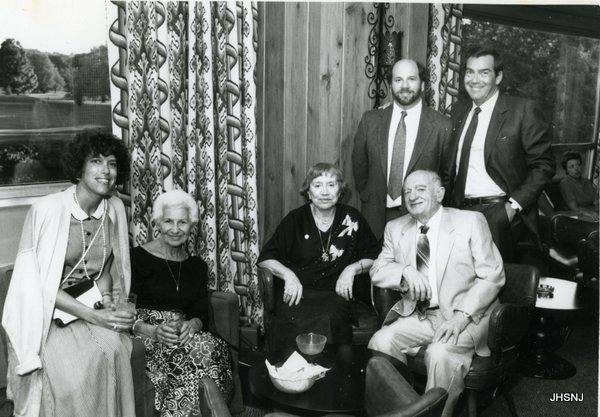 Jewish Federation of North Jersey Israel Bond Meeting 1987, location unknown….Seated l-r: ?., ?., ?. and Art Wichman…Standing l-r: ?. and Sandy Garfinkle. Notice the woman seated in the background by Mr. Garfinkle’s elbow. Notice all the interesting attire and home decor! Help us identify the rest please. We can identify the seer of the future state of Israel and some past Israeli prime ministers on the wall but who is presenting the “certificate of honor” and who is receiving it? Who are the people looking on at this UJA event when and where was the photo taken? Help us please! 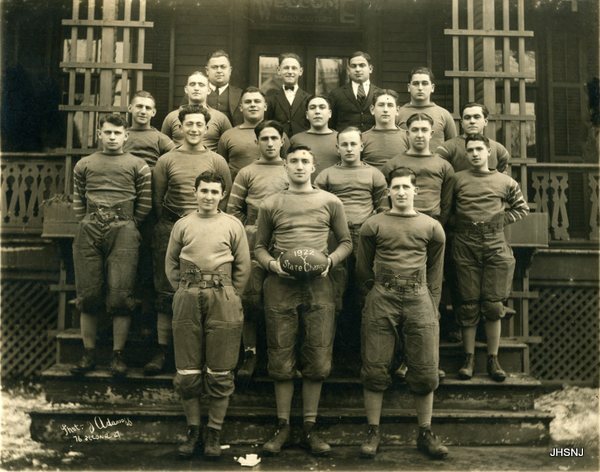 SPORTS BONUS PHOTO #1: This 1922 Passaic “Y” football State Champs photo was taken by Adamoff Photo Studios of Passaic. Who are these earnest young lads? Benedict Kreiger is in the photo somewhere. Rabbi David Panitz attaches a mezuzah to some mystery door. Standing next to Rabbi Panitz in his leisure suit (remember those!) is Fred Lafer and to his left is Gerrard Berman. Mitchell Zalon is on the far right. Who are the rest? Who are the children? 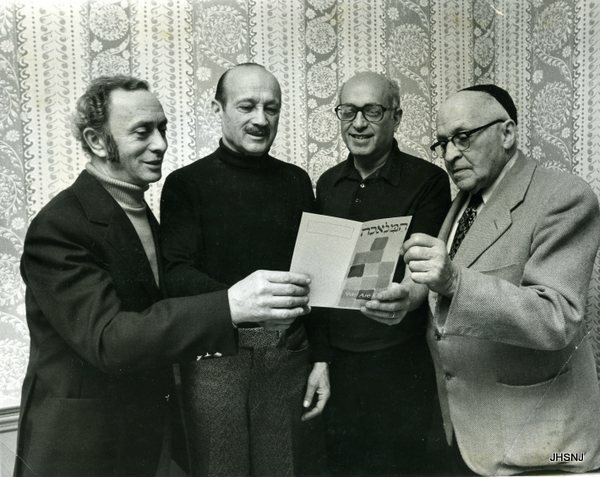 Paterson General Solicitations Breakfast, March 23, 1975…l-r: Abe Citrin, Harry Salton, Max Dimond and Seymour Rosenberg are holding a pamphlet titled “We Are One”. Abe Citrin is the father of Barry Citrin, one of our volunteers. Abe, now 94, is still living in Fair Lawn! 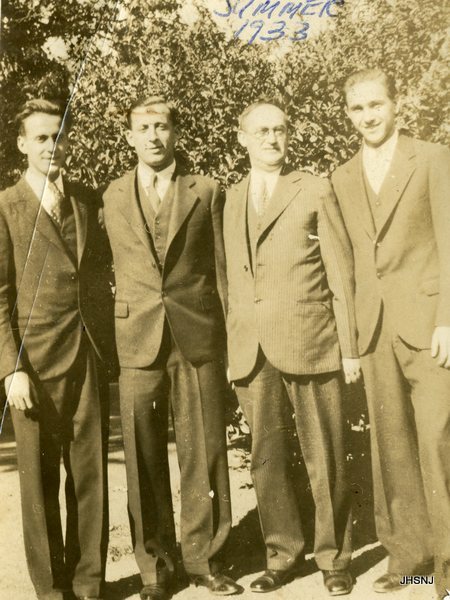 The summer of 1933 and the Walkowitz men strike a pose. Anybody know where? 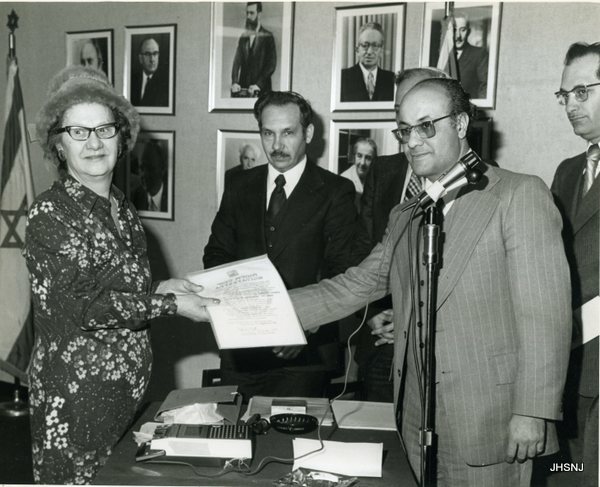 l-r: Sol Walkowitz, Lou Eis, Zisha (Alexander) Walkowitz and Joe Walkowitz. 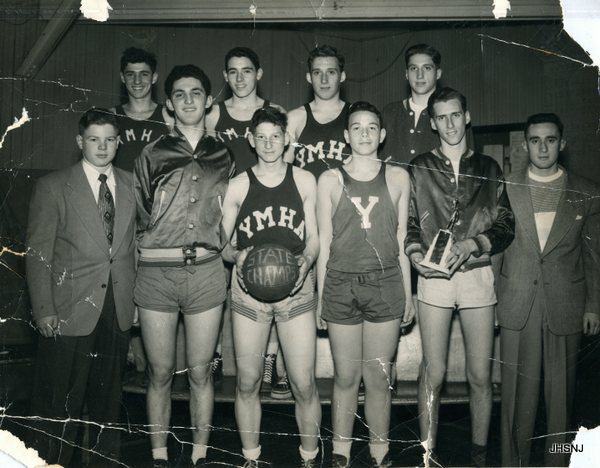 The Paterson “Y” State champs mug for the camera….but who are they? 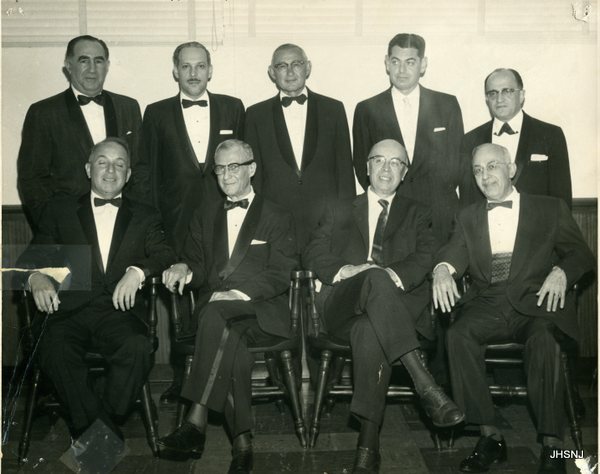 BONUS PHOTO #2: Temple Emanuel, Paterson, N.J. Testimonial Dinner, January 8, 1950. 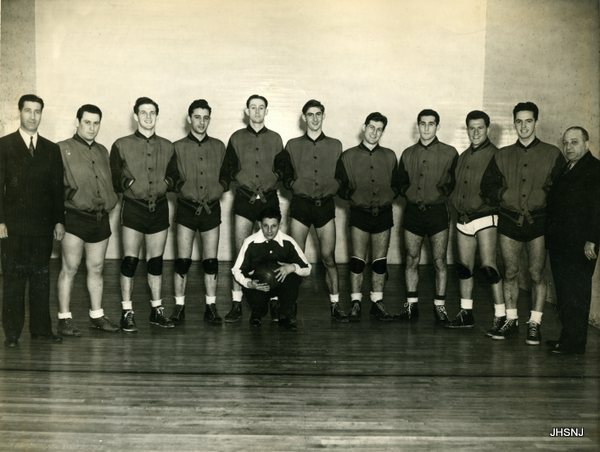 We can only identify Mr. Dimond, 3rd from left. He is holding an unlit cigarette. Times change. Boutonnieres, bow ties and butts are rarely seen in today’s photos. 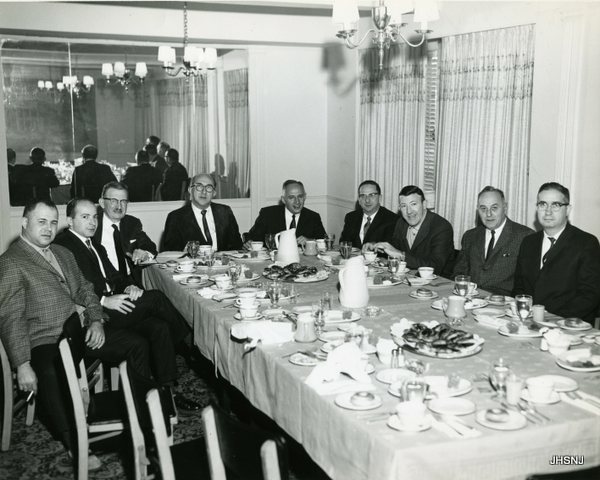 UJA Dentist’s Division Breakfast at the Alexander Hamilton Hotel, March 14, 1965…L-r: Daniel Piekarsky (holding cigarette), Drs. Sam Rubenstein, Philip R. Ipp, Mr. Gerrard Berman (General Chairman UJA Appeal Campaign), Drs. 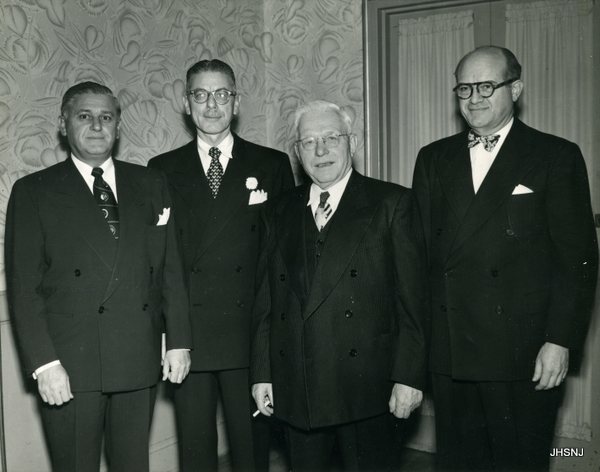 Mayer Mechanic, Fred Blake, Charles Adrian, Aaron B. Markowitz and Marvin Tuckman. It looks like uneaten challah rolls on the table. 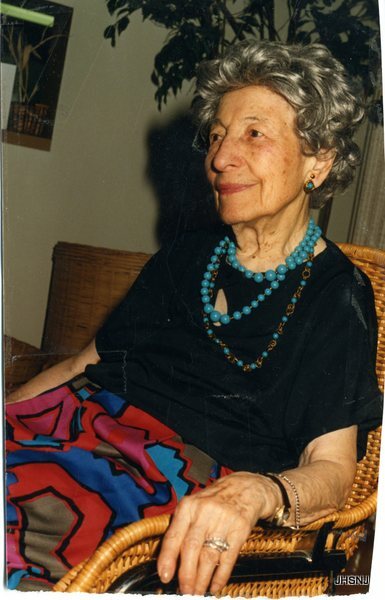 Gussie (Dorfman) Politinsky, 1896 – 1991: Born in Paterson, she participated in the Hebrew Ladies Benevolent Society and was one of the first of her peers to earn a driver’s license and to “bob” her hair. Gussie traveled by bus to New York City (1940s-1960s) to study at the Art Students League. She was the proud grandmother of five, 2 of whom are Richard Polton and Mireille Lipsitz Schuck. You can see by this photo how artistic she was. 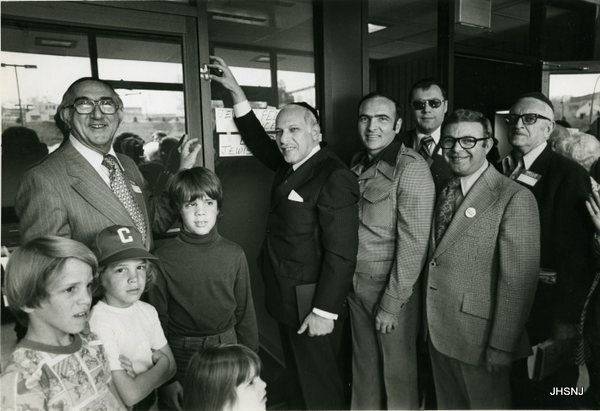 Mort Rittenberg is on the far left. Where was it taken? Which team is it? Who are the other players in this photo? Help us out please. 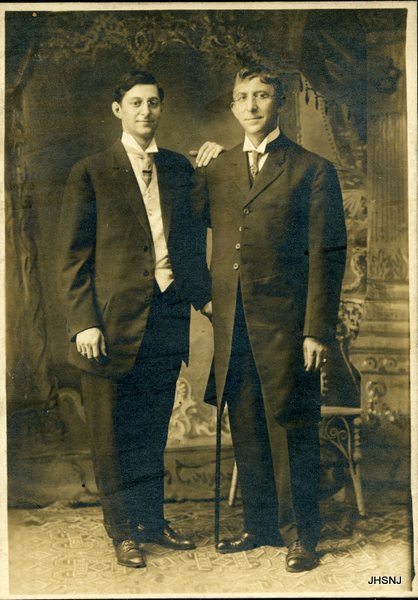 Jacob and Max Rosen, 1905. Max Rosen was the first president of the Barnert Hospital, Paterson, N.J. 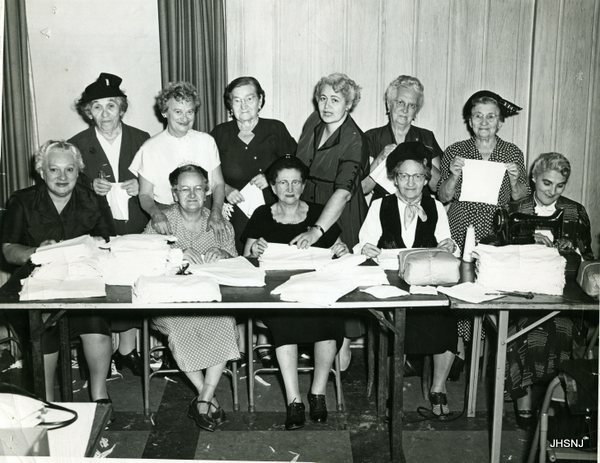 Bonus Photo #1: Paterson YMHA Cancer Dressing Unit, 1954. Who are all you sweet and dedicated gals? We need your help identifying them! 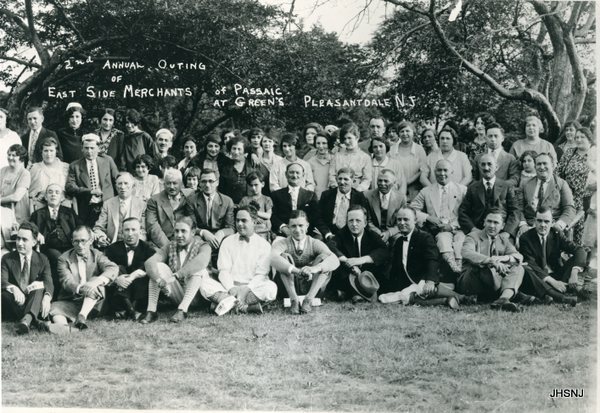 Bonus Photo #2: The second annual outing of East Side Merchants of Passaic at Green’s in Pleasantdale, N.J….Everyone is unidentified but it looks like the 1920’s or early 30’s. Please help us people of Passaic! A reunion of friends…date and place unknown. 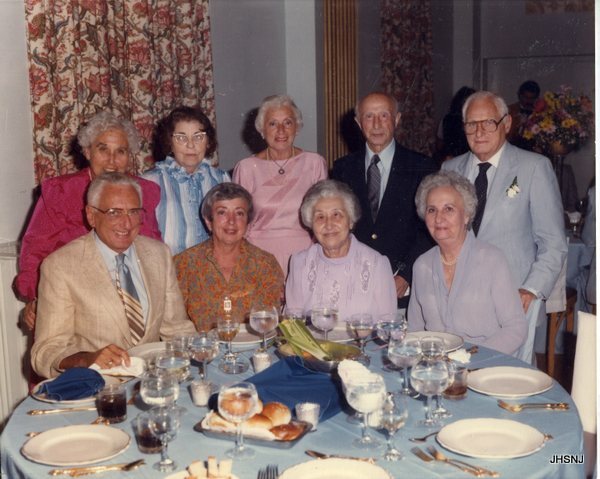 Seated l-r: Fred Wolf, Sylvia Speigel Wolf, Ida Geisler Cohen and Pearl Wolf…Standing l-r: Mae Reiss Bogart, Belle Harshorn, Blanche Wolf Rich, Saul Rich and Jake Wolf. 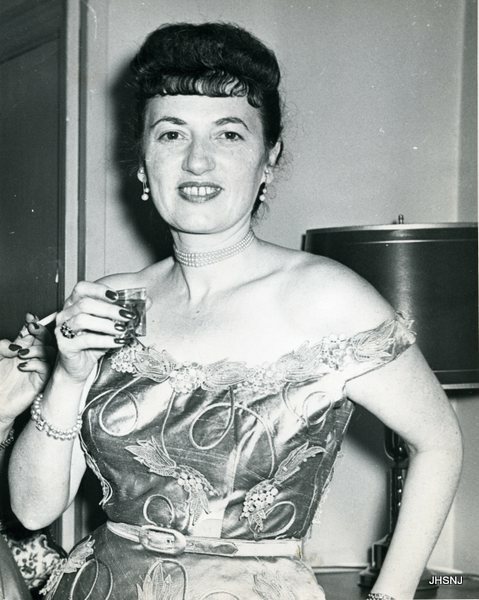 Who is this mystery woman with her “pin-up girl’ bangs, pearls,satin off the shoulder dress, painted nails and shot glass. “A cigarette that bears a lipstick’s traces…” This nifty photo was found in Judge Irving Rubin’s collection. 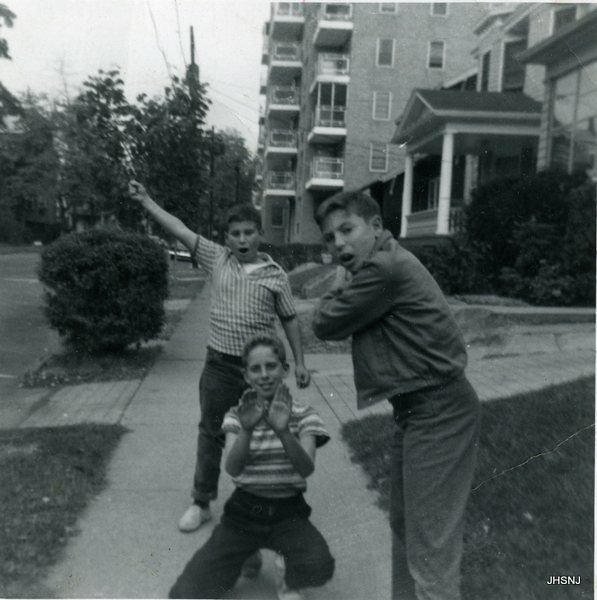 Steven Steinberg, Danny Ginsberg and Mark Kaplan simulate playing baseball…our future grads of Eastside High School, Paterson Class of 1969…This class is having its 45th reunion this fall at the Brownstone. Where is the location.? It looks like 30th Street near Park Avenue, Paterson, N.J. 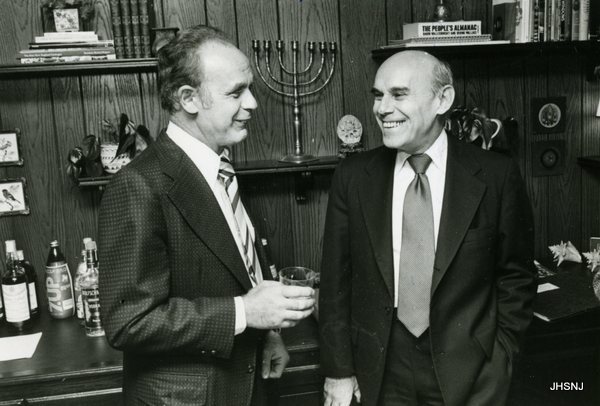 BONUS PHOTO #1: Fair Lawn UJA Campaign Leaders Sig Herrmann and Abraham Kremer discussing plans for the General Solicitations Drive on April 16th…year unknown. The background home decor evokes many memories of the early 70’s! 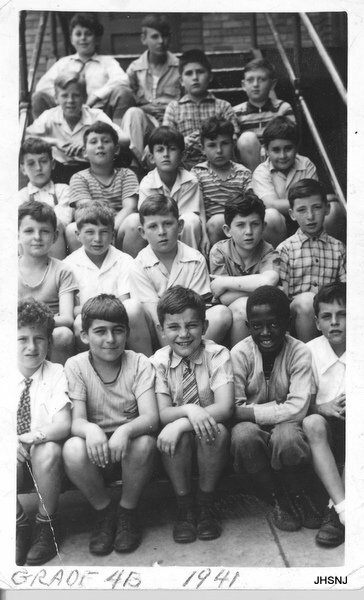 BONUS PHOTO #2: Ida Geisler Cohen’s grade 4B class at Paterson School no.6, spring 1941; Front row: L to r – Marty Greene, Irving Leiberman, Mary Apolito,? 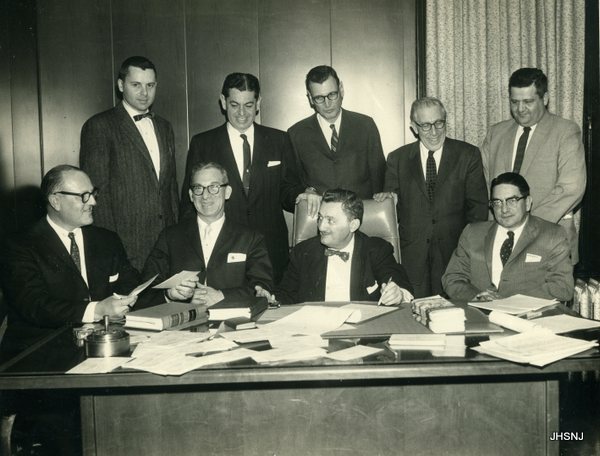 Davis,Harold Collen; Second row: L to r – Murray Guttman, Ira “Ikey” Lotter, Allen Kasse. 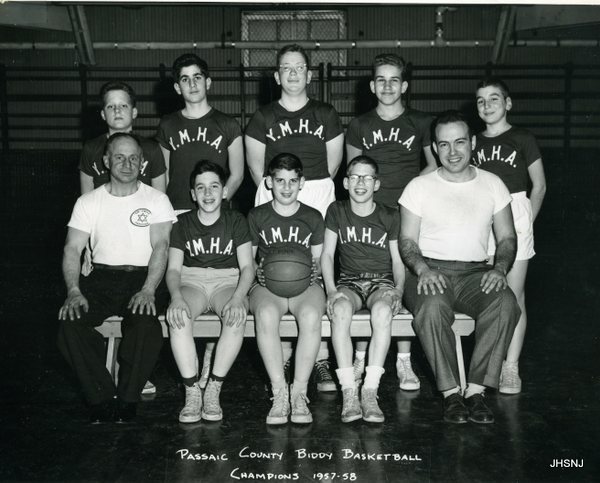 Eddie Kessler, Howard “Sonny” Barr; Third row: L ro r – Harvey Goldberg, Albert Abramowitz,Marty Rittenberg,Bernard Simon, Richard Fischer; Fourth row: L to r- Jim Winters, Vincent Tarazona, Joel Kabat; Fifth row: L to r – Eugene Bova,?